I was 21. I was in the middle of discovering who I wanted to be in life and had only the idea that the world I was in was larger than the town I lived in. Oh, and gas prices were $1.10. 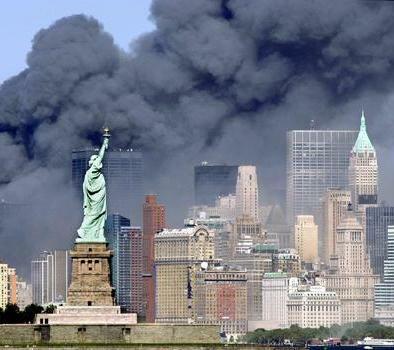 The terrorist attacks in New York ten years ago from this date made it clear that being a citizen of the US was more than just paying taxes. There is the responsibility as a nation to stand by one another when our freedom is under attack. I had just arrived at the CSU parking lot which is now the new Rec Center. When I walked into the computer lab our class was on hold and TV”s were out in the halls. Something about a plane crash in New York. I sat down at my station and every web page had live online coverage of what would change US history forever. I felt weak, enraged and worried. But most importantly, I felt an immediate connection to everyone in the building. I”m not sure whether it was the shock or the fear but our nation was under attack and I didn”t know what to do. What was next? Where is my family? Do I know anyone? Do they need help? Cell phones jammed?! WHAT!? To all the soldiers, emergency responders, families of the lost, individuals who had their life taken away and to those who continue to preserve freedom.